Book Description: In Matthew Inman's 5 Very Good Reasons to Punch a Dolphin in the Mouth (And Other Useful Guides), samurai sword-wielding kittens and hamsters that love .50-caliber machine guns commingle with a cracked out Tyrannosaur that is extremely hard to potty train. Bacon is better than true love and you may awake in the middle of the night to find your nephew nibbling on your toes. Inman creates these quirky scenes for theoatmeal.com, which launched in July 2009 and already has more than 82 million page views. In fact, every 15 to 30 seconds, someone Googles one of theoatmeal.com's creations. Now, 60 of Inman's comic illustrations and life-bending guides are presented in full-color inside 5 Very Good Reasons to Punch a Dolphin in the Mouth (And Other Useful Guides). Where has Matthew Inman (a.k.a. "The Oatmeal") been all my life? Until recently, I've not been familiar with this seasoned web-designer-turned indie web-comic creator. It seems the man's found his calling; whereas he was once dealing with all manner of crap in his one-time profession, he's now turning the laughably unfortunate situations in to plain laughable ones. 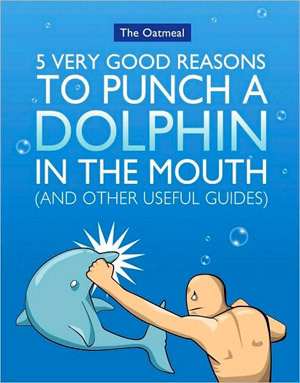 5 Very Good Reasons to Punch a Dolphin in the Mouth is a compilation of humorous illustrations, some originating from the author's website and others created specifically for the publication. Whether you'll find the content funny certainly depends on your preferred brand of humor. This book's got irreverence and a healthy dose of misanthropy. The Oatmeal knows how to turn life experiences into bite-sized bits of hilarity. Sometimes you'll laugh at the absurdity of situations. At others, you'll laugh because of the truth lining the commentary. The visual style, however, is pure caricature, and fits perfectly with the kooky tone of the content. "Why It's Better To Pretend You Don't Know Anything About Computers"
"8 Ways To Tell If Your Loved Ones Plan To Eat You"
"The Ten Types of High Fives"
"How to NOT Sell Something to my Generation"
As a big fan of situational humor, I enjoyed the content immensely; I'll definitely be gifting copies to my friends come Christmastime. ^_^ If you like Stephen Colbert, Justin Halpern, or The Onion, this book should be right up your alley. It's an eye-catcher, for sure!